At the start of the Revolution, the Continental Congress allowed the colonies to print their own currency to help pay for the war. The Maryland Assembly approved an issue of $266,666 to be redeemed in gold or silver at 4/6 sterling per dollar by January 1, 1786. Backed by £100,000 still on account at the Bank of England, the emission was used to promote the manufacture of gunpowder. To continue to pay for the war, the Maryland Assembly approved an emission of $535,111. 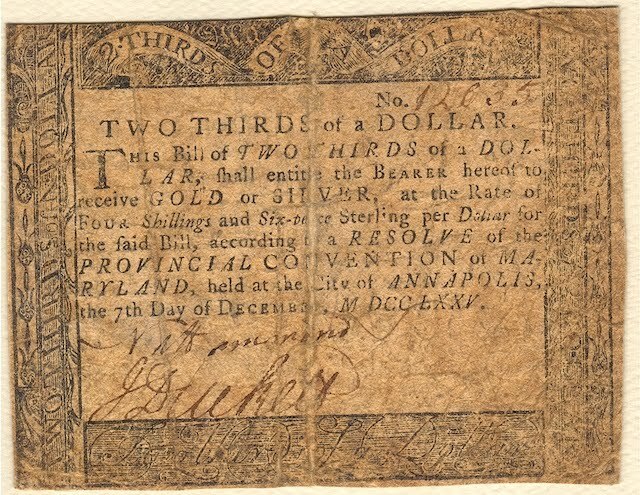 The notes were to be payable by January 1, 1786 in gold or silver at the rate of 4/6 sterling per Continental dollar. Frederick Green printed these notes using new copper plates engraved in Philadelphia. The back depicted an arm holding a shield with the hand clenching the strap of the shield and holding a victory laurel with the motto SUB CLYPEO (Behind the shield). 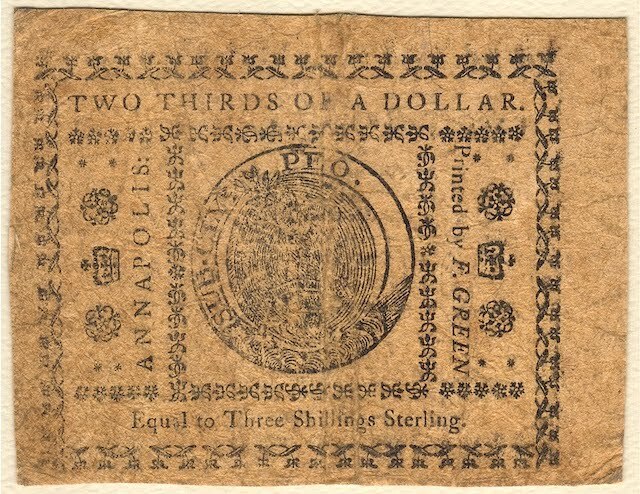 My new purchase in my Maryland Colonial series is a Two-Thirds Dollar note that was valued in 1775 as worth 3 Shillings Sterling. Because of the emergency nature of this emission, there were many signers of these notes. This PCGS Fine 12 example was signed by Nicholas Harwood and John Duckett. John Duckett, Jr. was the clerk in the lower house of the Colonial Assembly, Prince George’s County clerk, and distributor of currency on the western shore. Nicholas Harwood was Associate Clerk of the Court in Anne Arundel County from 1772–77 and later became Clerk of the same from 1777–1810. Harwood was a delegate to Maryland’s Constitutional Convention of 1776.